LIQUIDAMBAR (Liquidambar styraciflua) (Sweet Gum). Ornamental Trees. 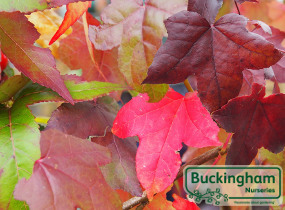 Excellent deciduous fast growing foliage tree with large maple-like leaves mid-green in spring and summer, turning to glorious orange, red and purple in autumn. Young shoots often have interesting corky wings. Prefers neutral to acid soil, but is lime tolerant given a good depth of soil. Makes an excellent specimen tree. TREE 20ft x 10ft (6m x 3m) in 20 years, ultimate height 80ft x 40ft (24m x 12m).